Faouzi Bensaidi born in 1967 in Meknes. 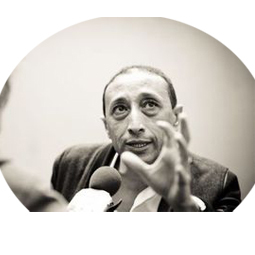 He is a Moroccan film director, actor, screenwriter and artist. After completing his diploma studies in acting at ISADAC in Rabat, he spent a further period of drama study in Paris from 1990 onwards, first at the Institut d'Etudes Theatrales at the University of Paris III and then at CNSAD. He began his filmmaking career in 1998 with an eighteen-minute fictional piece, The Cliff/La Falaise, which was followed by two further shorts, Journeys/Trajets (1999) and The Wall/Le Mur (2000). His first feature, A Thousand Months/Mille mois, was shown in the ?Un Certain Regard section of the Cannes Film Festival in 2003, winning the award for most promising newcomer. A key element of Bensaidi's style is his particular approach to the camera. He chooses lengthy fixed takes, long shots in which the distance from the subject is important, a sort of ?powerless gaze contemplating what happens to the characters. In 2011, his film Death for Sale premiered at the Toronto International Film Festival in September. A master class where Faouzi Bensaidi's visual patterns are exposed and discussed. Why the visual rhythm is important in the film making process? How to create your own visual language and in the same time get inspired by other film makers.